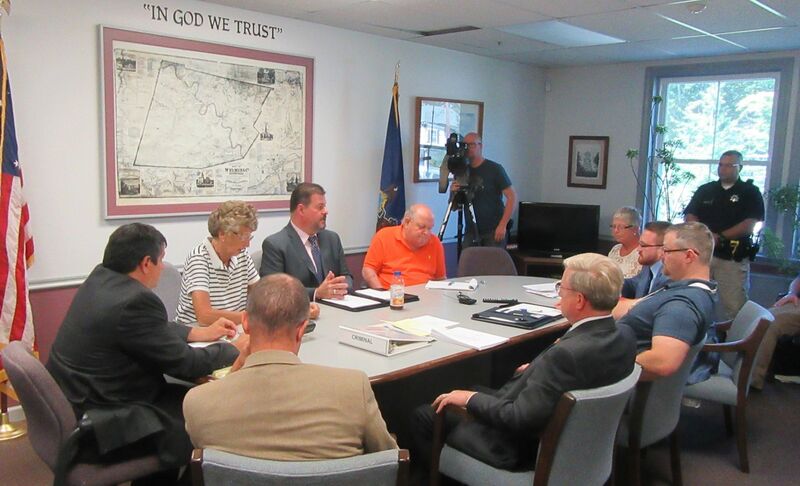 The Wyoming County Prison Board, including (above, from left) Atty. Paul Litwin; Commissioners Judy Mead, Tom Henry, and Ron Williams; Atty. Steve Franko; Warden Ken Repsher; President Judge Russell Shurtleff; and DA Jeff Mitchell met before a standing-room-only crowd on Aug. 24 to discuss ways to reduce the county’s skyrocketing prison population. Wyoming County Commissioner Tom Henry addressed members of the County Prison Board at an emergency meeting held at the courthouse in Tunkhannock on Wednesday and offered a dire prediction. Unless something can be done to curb overpopulation in the Wyoming County Prison system – immediately – the county could be out of money by mid December of this year. “That’s going to affect everyone,” Henry stated. With well more than 100 inmates in a system designed to hold no more than 70 for most of this year, the county is currently paying $75,000 per month from Act 13 funds to house prisoners at other jails. During the course of an hour-long meeting, the public had a rare opportunity to address judicial officials, and a number of long and short-term solutions were brought to the table. The option of constructing a new prison was soundly rejected, even by Wyoming County Prison Warden Ken Repsher. “As an administrator, it would be nice to have a larger facility with all the bells and whistles but, as a tax payer, I don’t want to do it,” Repsher stated. Henry said that his phone has been ringing off the hook about jail overcrowding more than any other issue. Families of loved ones incarcerated outside the county are upset about the distances they are driving to address the needs of the inmates, including picking them up if they are released. The state police and sheriff’s office have informed Henry that they too are having a tough time keeping up with the surge. “People are looking at what’s being done in other counties and asking why we can’t do some of those things here,” Henry added. Others, closely associated with recent efforts to get the county to address drug use and addictions as a health crisis rather than a criminal act, feel the money now being spent on prison outsourcing could more effectively be used for treatment centers and transitional housing. President Judge Russell Shurtleff asked to speak first and offered several pages of statistics that he and his staff had compiled. There has been a 41 percent increase in criminal arrests in the past six years, he noted, with a 10 percent increase expected in 2016 alone. By year’s end, more than 600 criminal cases will have been processed by the court. “For a county our size, that’s a huge number,” said Shurtleff. Placing more inmates in the probation system or on electronic home monitoring, he suggested, would be possible if attorneys file such requests on behalf of their clients. But they are not, Shurtleff explained. The county does have a supervised bail system such as that used effectively in neighboring Bradford County. Only one lawyer so far has made a request for it, and it was granted. But the person who got supervised bail violated the terms of agreement and ended up back in jail. Nonetheless, Shurtleff continued, increased bail supervision, more electronic monitoring, the addition of a veterans court with state allocated funds, and the hiring of an additional probation officer at $48,000 per year to implement such programs might be the best solutions to the crisis. Celeste Kranick, leader of The Addicts Mom, blamed a failed prison system for a serious mistrust among the public of the county’s judicial system. “I understand that, when you do a crime, you have to do some time,” Kranick said. But she was upset to learn that a young lady who had been led to recovery recently got a letter from the probation department informing her that she was going to have to go back to prison because she was not keeping up with their fines. Chief probation officer Krystal Kowalczyk and former president judge Brendan Vanston, both of who were sitting near Kranick, emphatically denied that any individual has ever been taken out of recovery and returned to jail for failure to keep up with fees and fines. “I’ve seen the letter,” Kranick retorted. According to Kowaczyk, such letters are issued automatically. “It’s a tracking system,” she explained. “When people are behind…a letter will go out without regard to where they are…,” suggesting that the computer system does not distinguish whom the letters are sent to based on an individual’s treatment progress or lack there of. There are currently 670 adults under parole supervision, that in itself representing a 13 percent increase over the past two years. Each county probation officer currently manages about 100 cases. The county will collect approximately $500,000 in costs and fees from those on parole or probation in 2016. Lizz DeWolfe, organizer of the recent Not One More Addiction and Overdose Awareness Rally, winced at the half-million dollar figure and echoed Kranick’s assessment of the county’s judicial system, suggesting that the overcrowding is the direct result of an opiate addiction epidemic that the county has never properly addressed. “They are stuck in an endless cycle of addiction,” DeWolfe said of those who have been in and out of prison on drug-related charges. She also called for transitional housing, daytime reporting centers (DRC), and more compassion at the time of arraignment. “We have the funds, but that doesn’t mean that we have someplace to take them,” Henry agreed. Part of the information that Shurtleff had distributed at the start of the meeting included a 2015 report by John Hogan, Luzerne County district manager of GEO Reentry Services, which manages a daytime reporting facility in Wilkes-Barre. Hogan determined in his report that establishing and maintaining a DRC in Wyoming County would be cost-prohibitive at $500,000 and suggested instead that those in need of such a facility could be directed to Luzerne County at an annual cost of $237,250. Hogan recommended the hiring of an additional probation officer to lessen the workload of current officers if bail supervision and electronic monitoring were increased, and more offenders were placed in drug treatment court. Commissioner Ron Williams said that the 2015 report was flawed and that his fellow commissioners in Lycoming County were pleased with the results of their DRC and recommend Wyoming County officials take a closer look at the possibilities of a DCR here. One idea produced during the meeting quickly gained traction because at least some of the infrastructure is already in place – video conferencing of arraignments. Apparently, this has been done to some extant, and the county’s district magistrates have offered favorable reviews. The system, which includes cameras at each magisterial justice office, the county prison, and the PA State Police Barracks at Tunkhannock has never been fully integrated, nor are enough people trained to use them. “Many times, people can get out on bail at that time,” Franko said of the potential of video conferencing. “It saves people time and money,” Williams added. “That’s something that we can do right away,” Henry stated. As the meeting wrapped up, Franko expressed support for Judge Shurleff in the face of public scrutiny.